All of the modern ones do. As with the old threaded tenons, they glue a insert into the meerschaum shank. In this case, I think it's a tube of Delrin. Then the tenon is also Delrin or similar. The tenon doesn't mate with the meerschaum at all, only the reinforcing Delrin insert. I was definitely thinking "briar style" meant the plastic/delrin tenon interfaced directly with the Meerschaum, which seemed less than ideal. Thank you for the explanation, much appreciated. I guess there's a insert in that shank somewhere. I have had no problems with mine! All imps use the higher quality tenon system just like baki pipes.i have some imp pipes that are over 15 years old and they use the same tenon as the newer ones. Some imp pipes i have smoke as well as any baki have ever smoked. I think the ones with the silver on the stems are a nicer quality stem as i have a few imps without the band and the stem is kind of chunky. You can see the insert in this photo. It's the same length as the tenon. See where the airway narrows? That's where you hit actual meerschaum. The silver ring + insert form the structural support for the tenon. 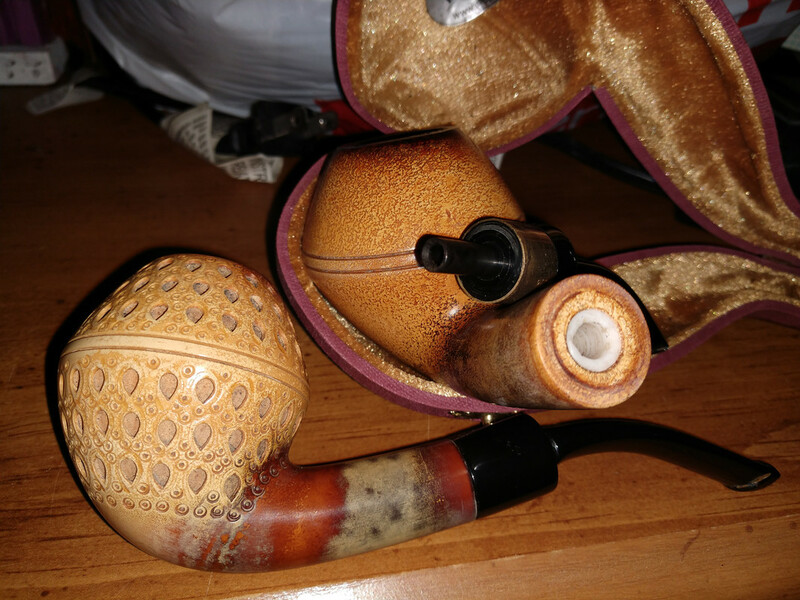 The meerschaum should not be under a lot of strain. Shoulda told me that the tenons were crap. People are always honest when you don't want them to be. The damage is done, a big fat bent billiard on the way. Here it is, it definitely happened. 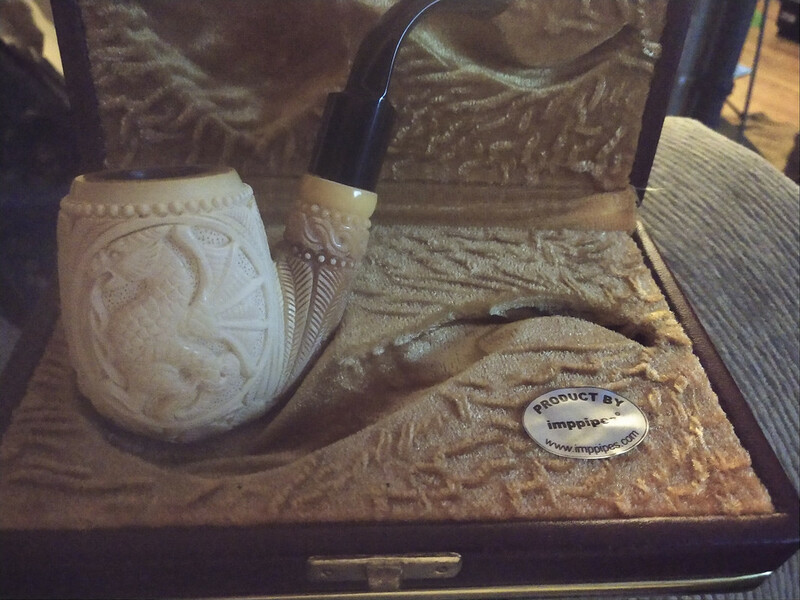 It is the same pipe that I posted a picture of earlier when inquiring about the tenon. It's a really beefy pipe, the biggest Meerschaum I've ever encountered. The only thing I don't like about it is the stem, which is ugly as hell. It will be getting a new one ASAP. Hmmm, I like that stem.... it makes the pipe unique-ish. My Gigantic IMP acorn meer has a orange swirly ugly old stem, and I like it. It will grow on you. That stem is gorgeous, but I like a little gaudiness from time to time, along with almost anything green. Thankfully, the full extent of its green gaudiness is really only visible under bright light. In lower light you could potentially mistake it for a grungy black stem if you weren't studying it closely. If it fits (hopefully it should, it's a 9mm pipe) I can maybe get a faux spigot look going and take the gaudiness in a different direction. If it doesn't fit, guess I'll send it off to Norwood or somethin' for a tortoiseshell stem. I also like the stem!